Flinn's Journal provides some background info: This hotel was later called the Milner and finally the Adams before it was destroyed by fire in 1963.
my gramma used to get her hair done in the basement here. We used to explore the upper floors when we could sneak up there. Remember watching it burn down from our back porch on the upstairs floor before the trees got too tall. Little help here... anyone know where this hotel was? I've never heard of it before. Is the building still around? 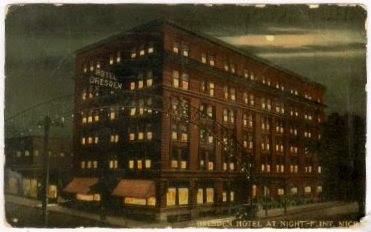 This hotel was later called the Milner and finally the Adams before it was destroyed by fire in 1963. I think it was on the southwest of 3rd st. and Saginaw.